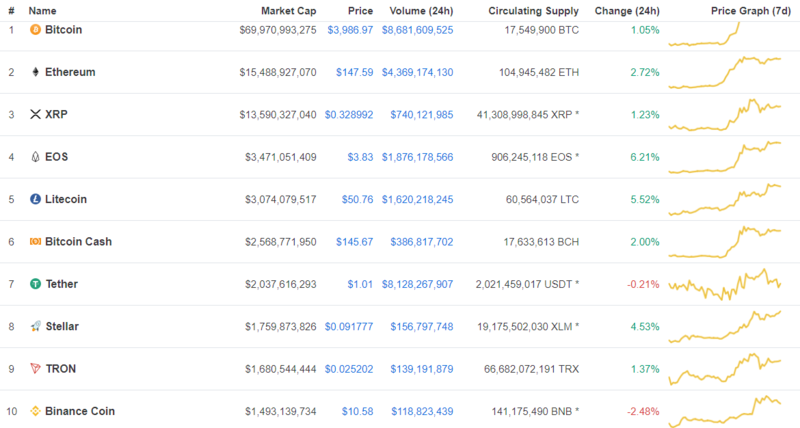 The crypto market maintains the momentum, as most coins on the top 100 cryptocurrency by market capitalization manage to stay green, with only few exceptions. The largest cryptocurrency, Bitcoin (BTC) doesn’t manage to stay above $4,000, although, it still gains slightly by 1.05% in the past 24 hours at $3,986 price point. The biggest gainer on the top 10 is EOS that gains by 6.21% at $3.83, while the biggest loser is Binance Coin (BNB) that is unable to keep the momentum and down by 2.48%, although still manage to stay above $10. After Maker caught the attention with the significant gain, it’s time for Crypto.com (MCO) to get the spotlight. The formerly Monaco is gaining by almost 20% at $3.36 price point, followed by REPO that’s up by 17.08% at $0.64 and Ontology (ONT) that sees a 10.34% gain at $0.74 price point. Among the few red color seen on the top 100, Veritaseum (VERI) seems to suffer the most with -17.1% at $17.81, followed by Revain (REV) and Ark (ARK), both see 4% loss at $0.14 and $0.62 price point respectively. As of writing time, the total market cap is $135,192,890,625. I hope this is going to last. Finally, the bearish market is changing to bullish. I like it when the graphics are green! Finally, the bearish market will go away! GO GO GO Bulls!